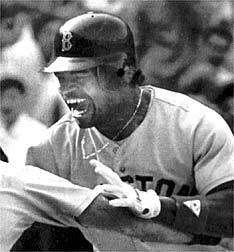 "I have followed them on a pitch-by-pitch basis since Johnny Pesky was managing the team. 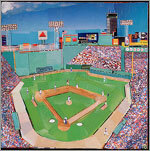 I have seen them participate in sixty-eight playoff and World Series games in five different decades. I have seen them play in person at their last three World Series - '67, '75', and '86. I have seen them win 9 Series games and 19 playoff games. I have seen them come oh so very close. You'd think that I'd become somewhat jaded over the years, but I am already pacing around like a young father, wringing my hands, waiting for the baby to be delivered. Five more days and my stomach, which is already in knots, will be like heavy water left over from the Manhattan Project. Win. Just win, please! 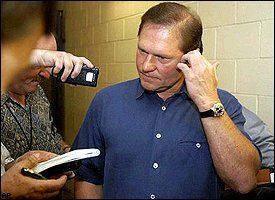 If the Pats, the joke franchise of all time, the freaking Pats - "Will Bob Gladeaux please report to the Patriots locker room?" - if they can become the model team in professional sports, then the Red Sox can certainly secure a championship sometime. There are no more Ghosts of Clive Rush, Ben Dreith, Chuck Sullivan, Rod Rust, and Victor Kiam. Instead, they have been replaced by two glistening Lombardi trophies on display in the lobby of Gillette Stadium. I am sick of 1918, Jack Hamilton; the St. Louis Cardinals; Bob Gibson, ski slopes in Colorado; Jose Santiago's bum arm; Eddie "The Fox" Kasko; trading Sparky for Danny "Are You Kidding Me?" Cater; trading the most popular player in franchise history for all players named "Tatum"; Luis Aparicio's base-running skills; Yaz not looking up to see where the runner is in front of him; three-run homers - starting pitching - and Earl Weaver's tomato patch out in the bullpen; losing Septembers as the Birds do nothing but win in the end; trading Reggie Smith and getting Reggie Cleveland as one of the players in return; Vern "High and tight to Rice" Ruhle; rain delays which cost World Series games; Larry Barnett and Ed Armbrister; Rick Wise and his unlimited potential; Cecil "Mr. 1 for 18" Cooper; Bill "Let me do my Rip Sewell thing in the 7th game of a World Series game" Lee; Darrell Johnson taking out Jim Willoughby for a pinch-hitter; Jim Burton - "let's see how the kid does here"; Joe Morgan and his squirting fly ball; the wasted talent of Roger Moret; Fergie Jenkins on hash; Craig Nettles; Mickey Rivers' sucker punch; The Gerbil; no hurler to back up El Tiante; "You know, Ken, Tom House is going to be the next great closer"; losing to the Yankees twice on the last weekend of two successive seasons; trading away Bernie Carbo and ignoring Yankee killer Bill Lee; Bobby Sprowl, the poor kid - up yours, Zim; the Boston Massacre; Lou "Mr. Sun Glare" Pinella; Steamer and a hanging slider to Reggie; Yaz swinging at the first strike; the unjust firing of Martin and Woods; Luis Tiant and Boomer in Yankee uniforms; Jerry Reinsdorf - the most evil man since Harold Frazee; Haywood not dropping Pudge's contract in the mail before December 31st; the Major playing with dirt in front of the dugout; the New Gold Dust Twins - Reid Nichols and Shag Crawford; John McNamara and his pea-brain; Tom Seaver's bum knee; what the hell is Schiraldi doing out there? ; My English neighbor on seeing who's coming in - "Not Bloody Stanley! "; Geddy's passed ball; "Son, this is the darkest day in this town since Jack Kennedy was shot"; why isn't Can pitching the final game? Al Nipper actually pitching in game 7 when it mattered - Al Nipper! Cokehead Strawberry taking five years to get around the bases.......etc., etc., etc." Just win. Please. Please. With jimmies on top. 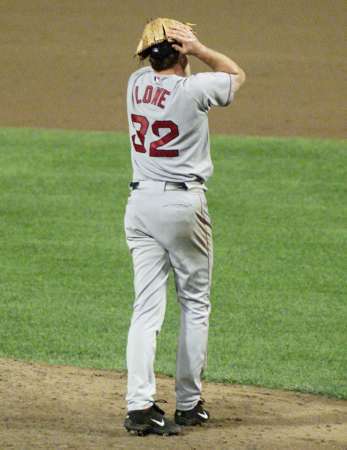 Former Sox Cy Young candidate Derek Lowe will not be pitching in his regular start on Sunday which would have lined him up to start Friday or Saturday in Boston (BK Kim may start the final game of the season). 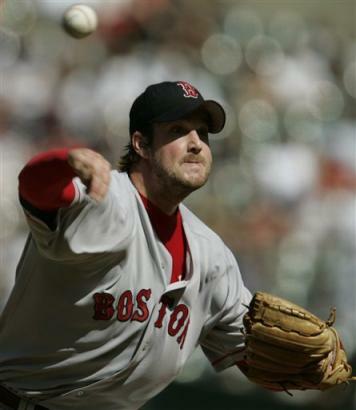 Bronson Arroyo and Tim Wakefield are expected to be named Game 3 and Game 4 starters for the ALDS. 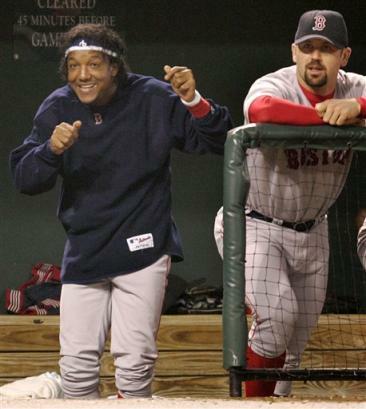 So is D-Lowe when Sox run is done.